It’s certainly been cold in the early mornings here in Mwandi so winter has set in. Last night a hippo was grazing across the river from the house, it sounded like he was in the front yard, making so much noise munching away, the dogs were going crazy. The hippos are back in the river as the river has dropped so much. I am now at 32 weeks of the pregnancy and I am quite big compared to Lucy’s pregnancy. Back at 22 weeks we travelled to South Africa for the 4D scan and I am so glad we were able to do that, it’s a great relief to know that all is well with our baby. I have been lucky enough to be able to see two visiting gynocologists from USA to the mission, so I am well looked after. My BP is high so I shall travel home earlier than expected. Gregor, Rury’s brother will be getting married in Wales the first week of August, Ruairidh and Lucy will be attending the wedding, then will fly to Port Lincoln from there. Lucy will stay and Ruairidh will go back to Mwandi after a week in Australia. He will return a week before the baby is due in late September. Lucy loves going Tiger fishing with her daddy. She wears her life jacket and off they go with Morris (the dog) in the boat. She always comes home exhausted and doesn’t stop talking about the adventure. Lucy still loves attending pre-school each day and going to the farm with her daddy. I have not been able to teach Sunday school for quite a few months now as I am just been so tired by the time Sunday comes around, but two young Lozi men have taken over from me. Ruairidh is studying his Masters in International Community Development and is going well. He certainly is covering some really interesting development topics. Our new Deaconess had her induction on the 3rd Sunday in July, I couldn’t get there but we could hear the service from the house. She is a lovely lady and has been coming to help run devotions, staff symposium and some counselling sessions at the OVC Project. She is also a very keen student in our new sewing club intake. Precious the Projects Secretary has had a boy called Jasper who is very cute and doing well. The mission has had some visiting Canadians here for 9 weeks, they are all social workers and were able to run some staff symposiums and spend time listening to children’s problems, encouraging our child counsellors and running research on our feeding program. I wanted to know if the children were enjoying the activities we run at the project, how we can improve the food, how the children are treated by staff and other children. This research helps us improve our menu, recreation activities and spend more time teaching staff on how to treat our children. I am looking forward to receiving the report on the research and wish to thank the visitors for their time and efforts at the OVC Project. We recently had the Sewing Club graduation for the last group of students; it was a nice celebration with invited guests from the community attending to encourage the students. We now have a new intake of students both in the morning and a group in the afternoons. Our Carpentry Centre received an amazing donation from a wonderful man, enabling us to buy 3 Industrial machines – a Surface planner, Table saw and Thicknessed Planner. These will enable us to generate income for our projects electricity bill and help us produce some wonderful furniture to help sustain our carpentry centre. The students will also be able to learn about larger carpentry machines and how to maintain them. It took me a long time to source the machines in South Africa but they were delivered in mid-July. We are truly blessed with the support we receive at God’s timing and our community will only improve through our vocation training. The machines are just fantastic and we have constructed a huge shelter with store room to protect the machinery, keep them safe and allow plenty of airflow. The students helped erect the roof and did the carpentry work. In May a team of 7 men came to Mwandi from around South Australia, my father led the group to install water at the Mwandi UCZ Basic and High School among other work they did to help us progress at the project and on the mission. The men made 6 tank stands and laid 2km of 2″ poly pipe all around the schools with taps at staff houses. Local men were employed to help with the work and they learnt new plumbing skills as they went along. The schools now have running water, which is something we take for granted in the west but here in Mwandi it most certainly is not. The children and staff are very happy. The group visited some outlying churches; they preached locally, shared at the OVC devotions, at boys and girls brigade and were a lot of fun to have around. We have also had quite a few individual visitors and teams to the mission already this year and we are so thankful for the hard work that has been achieved for the project and Mission programs. Thanks so much to you all for coming to Mwandi to serve, support and love our children and teach our staff new skills. Our Micro-finance Program is going well and the ladies are making some impressive clothes. Each month we visit the business ladies to appraise their progress on sales, management and if they are coping with maintenance of their machines. We also have further supplement to this program with the provision of saving and loans schemes to help these individuals access a means of investing returns but also to access small amounts of credit to assist them in developing their businesses. Our book keeper, Given received training in South Africa in Village Saving and loan’s schemes. The project has now 4 savings groups who meet monthly to save together, provide each other with small loans and also a lever of insurance. These groups have been very successful and have quickly grown. We have more than 70 individuals enrolled and the groups last year received an average of 21% return in their investments. The groups consist of some OVC staff but mainly enterprising marketers, fish sellers from the village. Winter time is when our children really suffer due to lack of clothing and nutrition – that is why our annual Blanket distribution is so important. We were able to buy 650 blankets from Livingstone thanks to your wonderful support. As our houses get colder in winter we turn on the heater or light our fires, but these kids are not able to do that. Our social support committee selected the children who received the blankets and they distributed the blankets over 1½ weeks. Thank you so much for buying a blanket for $15 each to stop the suffering of the children. I’d like to thank those who have sent postage stamps to Sandra Pugsley to help to reduce admin costs for educational support program. Please if anyone has a spare few dollars when you are at the post office, please consider buying us some stamps for our education program to help us and send the new stamps to Sandra Pugsley, every stamp really helps us. We have two young men Mushe Malamo (21 years) and Parent Phiri (19 years) who have both been accepted into University, Parent will attend UNZA- University of Zambia and Mushe in Copperbelt University. I used to teach these boys at Sunday school many years ago now. They have grown up to be very polite, intelligent young men and I am very proud of them both. They both have managed to secure bursaries from the Government but we need to find extra support of $2000 each year to cover expenses that the bursary doesn’t cover. Mushe is studying a 5 year degree in Forestry management in Kitwe and Parent aims is to study medicine , but has to start with studying Bachelor of Science and it’s a 4 year degree course in Lusaka. Both these boys have come from very poor back grounds and I promised their mothers before they passed away that I would make sure I would find support for them if they were ever accepted into University. If you are able to help partially or give a once off donation towards these young men please contact me. If we can keep young men of this standard of life in school then Zambia has something to be really proud about. OUR CHILD COUNSELLORS have been consistently visiting children at their homes on the feeding program who are HIV positive. We need to make sure that their guardians are aware of the importance of why the children need to be taking their medicine (ARV’s) daily and visit the HIV clinic at the Hospital for tests when given review dates. The children who are positive and attend feeding are doing very well and with the importance of nutrition, multivitamins, and education there is no reason why our children cannot live a healthy, rewarding life. Our children on the feeding program who are positive are able to play sports, attend school and enjoy life like any other child, amazing how a good meal a day can make a difference to growth not only in the body but in the mind. We are now Feeding 280 children 6 days a week. The recently added children to the program are all under 8 years of age and all HIV positive. During the winter season the children eat a lot of food and we have to increase the quantity of food. We would love to support more children who are HIV positive to give them an opportunity for a better chance of longer life, with this a very important program but need more funds to enable us to achieve this. We give our children a glass of milk three times a week each. The cost of the milk is $12,000 per year. We use 35kg of meat each time we have meat on menu. We recently have had to call in Social Welfare Department from Sesheke to come and discuss the future of three families of children that are on our feeding program. We have never had to call in the Department before but we are at a point where we had no choice as these children are stealing, being raped and their guardians are not doing anything to look after these children. The children are young (4 to 14 years) they are really suffering. The children’s parents are alive and the children’s orphan status is a Vulnerable (Parent not capable to look after their own children). 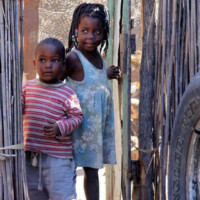 These children are starting to steal from houses on the mission, also in village shops and becoming prostitutes to survive. One of the mothers has a mental problem and just forgets to change the children’s clothes for weeks on end. She also takes the school books away from her children, so we are constantly giving the children books so they can attend school. Alcohol and remarriage where the new husband won’t accept past relationships children is a problem. The mother usually will leave her children to tend for themselves and she may come back from her “new home” once a week to check on them, but not leaving the children any food, just the hut, pots and pans. These children are on all our support programs and they receive two meals a day from us, breakfast and lunch so at least we know the children are being fed, schooled and receiving social support – clothes and blankets. BUT we feel that these children need to be in either a foster home or orphanage before they are put in jail for theft, contract HIV and become pregnant at a very young age. There are 10 children total in these three families and two of these children have special needs. Please pray that the Social Welfare department can come up with some good suggestions to protect these children, please pray that these children don’t suffer anymore and that we can come up with a plan for their future to be filled with hope and love. FINANCIAL SUPPORT – Can your Church, Bible study, work mates, family tithe to the OVC project each month whatever amount? It really does help us. Farmers – money from a few fat lambs and some acres when you reap your crops would be a great help as every cent helps us. Please check out the new Mwandi OVC Project web site – www.mwandiovc.com. A friend of Rury’s has been working and re designing new web site, he has wonderful talents and we really appreciate his help and support. Please let me know your thoughts on the website. If you receive this Newsletter via post but have an email address, please let us know your email address so we can add you to the email newsletter list to save costs on postage. Thank you so much for all the wonderful continued support you give to us at the project. Without your support we would not be able to support the Orphans and Vulnerable children. If you are holding a fundraising event for our OVC Project, please let us know so we can post or email you our information pamphlets, photos and 15 minute promotion DVD. I pray that you are able to fundraise for us so we can continue to support our children with the basic needs of life – Nutrition, Education, Medical and Social Support. May you have a wonderful day, wherever you are in the world. Financial support to continue to the Project in all of our programs. For safe travelling for Ruairidh and Lucy. Our children who are registered on all our programs at the OVC Project – for protection, Love and security.